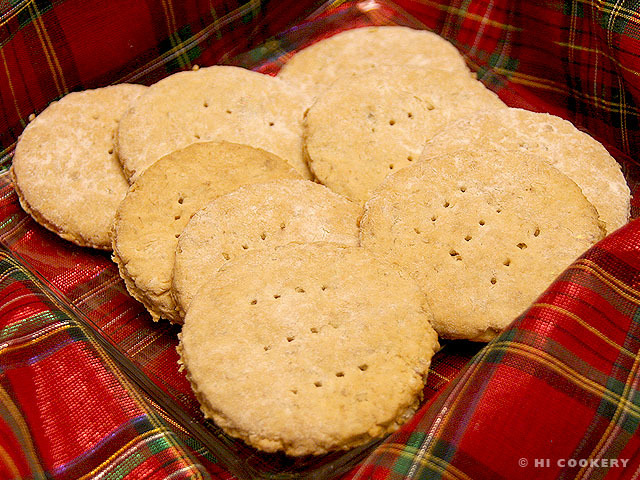 Highlander’s Mum has a well-stocked shelf of Scottish snacks, such as shortbread and oatmeal cakes, to share with family and friends who drop by to visit. We prefer to eat more of her sweet buttery biscuits than the bland ones. But once in a while, the oatmeal cakes are a nice change when she spreads them with her homemade jams or tops them with cheeses. Try the traditional Scottish oatmeal cakes as a breakfast biscuit, a tea time treat or a snack for National Oatmeal Day. In a large bowl, combine the oatmeal with the flour. 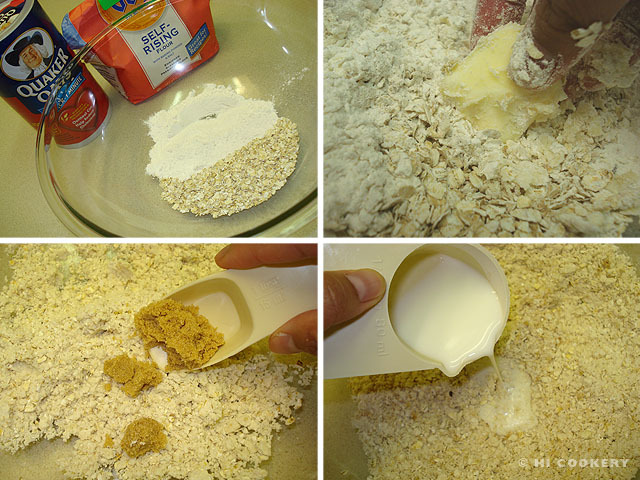 Cut the cold butter into small pieces and rub it into the oatmeal and flour with your fingers. Mix in the brown sugar. Moisten with milk to make a sticky dough. Transfer onto a sheet of floured wax paper. Sprinkle the top of the dough with a little flour. Place another sheet of wax paper on top. 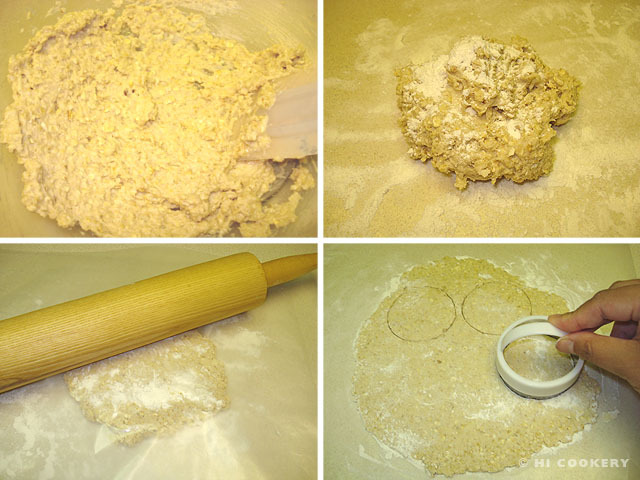 Roll out the dough to ¼ inch thickness. 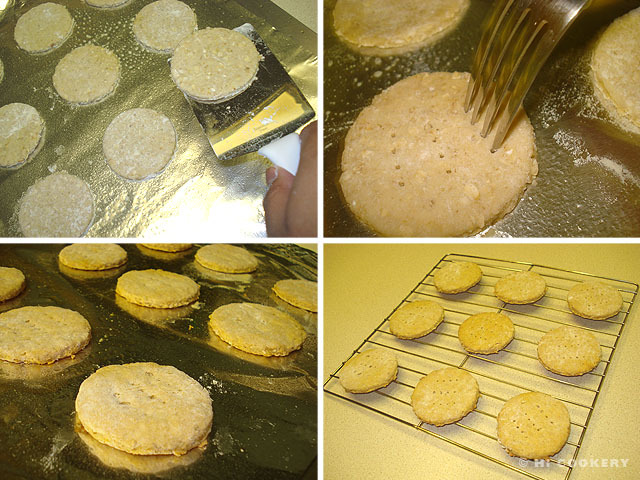 Cut with a round cookie cutter or rim of a glass. Re-roll the dough and cut more rounds. Place on a a greased baking sheet. Prick the top of the rounds with the tines of a fork. Bake in a preheated oven at 350 degrees F for 20 minutes or until golden brown. Remove from the oven. Let cool completely on a wire rack. The oatmeal cakes should harden to a crisp while they cool. If not using self-rising flour, then use 1 cup all-purpose flour sifted with 1 teaspoon salt and 1 teaspoon baking soda.